- In this third world there is a long, thin stretch of land in the southeast of the map. About halfway along this land is a forest. Enter it and you’ll find a surprise town, one you’ve never visited. - The Phantom Village is home to some of the best buys in the game. The initial shops don’t seem that fantastic, but if you enter the rear of some of these shops (rear-left side of the magic shop on the sidewalk, secret passage behind the left counter in the armour shop, through the back of the pub and into the house next to the weapons store) you can find vendors who will sell you some awesome spells, weapons, and accessories. - There are a few freebies to find here, as well. There’s a line of barrels in the pub; wait for the guy behind the counter to move south and you can find a Thief Knife in one of the lower barrels. In the house next to the weapons shop you’ll find stairs into the basement; in the southwest corner is a secret passage leading to a set of stairs that will take you to a black chocobo which can flutter around the map and land in forests. Last, there’s one more secret passage in here, straight across from the first, which contains the last piano. Speak to the bard in Crescent after mastering the piano and he’ll teach you the Hero’s Rime Song. - There’s a door in this underground hallway which you can’t enter, for some reason. You will come through here… but not via the Village itself. - Last up is a guy in the pub’s back room. He says he’ll give you something good - a Mirage Vest, in fact - but you must first ride a ‘yellow chocobo’ around the world. This doesn’t take as long as it sounds, because you don’t really have to ride Boko from one side of the map to the other. You basically need to do a big loop around the central sea of the continent and return to where you picked him up again. Make sure you include the long, skinny stretch where Phantom Village is located and you’ll almost certainly cover every point needed to earn the Vest. - Now that you have a black chocobo again you can reach the other half of this section of the walkthrough: Phoenix Tower. 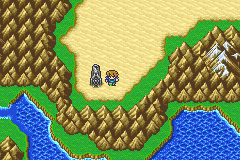 There’s a large desert in the northeast of the map that you can’t reach through any other means than a black chocobo, via the forest in the north. Land your chocobo there. This area is patrolled by powerful, hardly-worth-the-effort Landcrawlers, so unless you really like fighting you may want to put Flee on one of your characters. Phoenix Tower is located to the south. The Tower is an interesting challenge. It consists of thirty near-identical floors patrolled by random monsters, most of whom loooove their status ailments. You can’t run, either, so you’ll have to kill everything you encounter. Ribbons are highly recommended. Each level has either an obvious door you can run up or a hidden set of stairs guarded by an enemy, and you’ll have to check the walls to find the latter. They’re always in the same spot, but which door is guarded by an enemy changes. The ‘safe’ door is noted below. It’s important to note that the Phoenix Tower has pots, and though some of them contain items, others are monster battles against Magic Pots. Magic Pots are special monsters that negate your ability to use magic, and will ask you to give them Elixirs. Do so and they’ll either leave… or ask for more. Sigh. Each Magic Pot asks for up to three Elixirs per battle. Magic Pots are incredibly difficult to defeat, but you can flee them - and if you take the time to beat one with Elixirs you’ll gain an incredible 100 ABP. Niiiiice. Still, if you’re okay with grinding and don’t want to use up Elixirs, it might be wiser to avoid pots altogether. You’ll get a Phoenix Down for ‘beating’ a Magic Pot. On the top of the tower you’ll hit a cut scene, a rather tragic cut scene, and when it’s done you’ll gain the Phoenix summon. Now that you’re in the area you can get another summon, the great beast Bahamut, who relocated to the North Mountain after the events of the Pyramid of Moore. The Mountain is to the east of the forest where your black chocobo is waiting. Reach the summit of the Mountain and Bahamut will engage you in battle. Bahamut is tough, but not amazingly difficult. It loves all-hitting elemental attacks, specifically water and fire, and can also inflict poison on everyone as a side irritant. These attacks aren’t terrible, but they can be taxing if you don’t heal properly. Curaga is good for a while, but once Bahamut gets low enough (below 5,000ish) it will use Mega Flare, inflicting 5,000ish HP on damage on everyone. This will probably wipe out your party in a single go. Use standard tactics initially - strongest attacks, basically, since Bahamut isn’t strong or weak against anything in particular, aside from an immunity to earth - then, once Bahamut drops below 7,000ish HP, throw up Reflect on at least one person and keep on attacking. (The Carbuncle summon is wiser.) When Mega Flare goes off it will rebound on Bahamut, do 9,999 damage, and end the battle. Barring Reflect you can also straight out avoid Mega Flare with Jump, though this may leave you with one character and a pissed-off Bahamut. Regardless of how you win, you’ll gain the Bahamut summon.